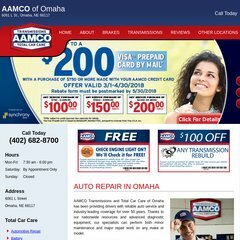 Topics: Special Offers, Appointment Scheduling, Total Car Care, Directions, and Aamco Coverage. It is hosted by Ntt America Inc (Colorado, Centennial,) using Microsoft-IIS/6 web server. Its 2 nameservers are ns11b.verio-web.com, and ns11a.verio-web.com. The site is programmed for ASP.NET. PING www. (198.65.250.31) 56(84) bytes of data. A time of 46.0 ms, is recorded in a ping test.